As usual ~ click the pics below to jump over to their Liqurious posts! 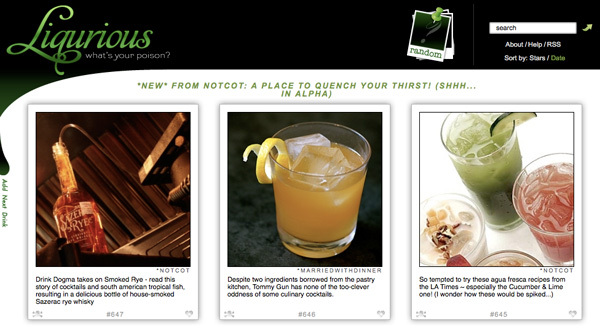 I’ve been in love with TasteSpotting ever since I found NOTCOT! & LIQURIOUS is the perfect counterpart for it! Wow! Outstanding work. I love the design and the content is outstanding. As I said in my article about Liquorious, I’m not sure how many RSS feeds you’re reading each day, but your filtering and editing abilities are bar none. Really, really great work here! and Nick ~ that gehry cocktail is awesome! just posted it! When will it show up in the Header bar? Also, bar snacks would be good. One of our local bars has the best Banana split I’ve ever had. Awesome Jean! I would love to see the different “aperitivo” style snacks you can find in your travels =) Remember pescheria DaClaudio?, the white wine with raw fish in a real fish market was really cool. Great idea—I’m not a huge fan of cluttered corporate sites and all their ads (pop-ups included), but I found this drink that uses absinthe (now legal in the States), and made to look like a Frank Gehry design. I don’t think it is quite up to Mr. Gehry’s standards, but its a great looking creation using liquor, and therefore I think deserves mention on Liqurious. Esquire has a bunch of great recipes, all with witty instructions and pictures, so you know how it should look. As for snacks, I think they either belong in a separate section within Liqurious. Kind of a sidebar, like .org is to .com. 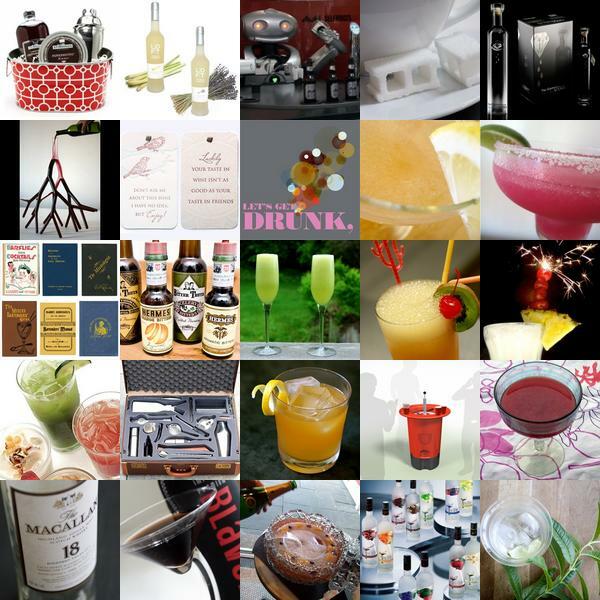 When good ones come up, you can post them on the main board, but otherwise people can look through them on Liqurious.org, along with other drink-related tidbits. You may want to check in periodically with the LCBO’s site - they publish a really great magazine for distribution in their stores called “Food & Drink”…full of ideas on drinks, entertaining, etc. Thanks guys ~ so glad you like it so far! As for food ~ i’ve been debating whether drink related snacks (versus full meal recipe pairings) should be fair game for Liqurious… not sure though ~ thoughts? Love this - well done - you’ve done it again! Glad things are progressing… but, are you now staying clear of food? I loved the mix of recipes for food and drink you had on TasteSpot. We are loving the new site. Being the cook in our group it is quite useful for our parties, even if I myself don’t drink.